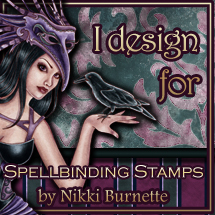 I’m thrilled to be here today sharing the adorable Wedding Owl stamps from Dare 2B Artzy. This set jumped out at me because of the expression on Mr. Owl’s face. His big eyes. He looks like he’s absolutely awe struck with his Bride. For this card I colored my adorable owl couple with my Copic markers. I added a little pearl embellishment in her head piece and a couple of dots of perfect pearls liquid to her ears to make earrings. I chose to use purple and orange as those were the colors for my own wedding. My hubby and I had a fall wedding in October 2010 and our flowers were purple and burnt orange. I think my bridesmaids and family thought I’d lost my mind when I chose those colors, but they turned out gorgeous. My husband looked somewhat similar to Mr. Owl as he waited for me at the end of that very long aisle. A little awe struck with tears in his eyes. He later told me that he doesn’t remember anything else in that moment, the people that were in the church, the music, the pastor. He said the only thing he saw was me and how beautiful I looked coming down the aisle. Awe! Yes, he’s still that sweet even 6 years later. He never misses a day telling me that he thinks I’m beautiful. I think he’s a keeper!! The Wedding Owl stamp set features several interchangeable sentiments that you could use to make wedding cards, anniversary cards or just a fun card for someone special. I chose to use the “Owl share my branch with you FOREVER” sentiment from the set. I heat embossed it with some purple embossing powder and then I die cut it using a little word bubble die. For my card background, I used a LOVE banner die and die cut the piece of gold polka dot cardstock near the bottom of the panel. Once I had it cut, I cut a rectangle sized piece of purple glitter cardstock and glued it to the back of the gold cardstock. Finally I was ready to add my owl couple to my background with some dimensional foam for the back of her to make it appear that she was in front of him, walking towards him. I also added some dimensional foam to the word bubble over Mr. Owl’s head. I added a full layer of a lighter purple cardstock to the back of my panel and glued the entire piece to my white cardstock base. To finish my card, I added some purple glitter dimensional gems to the bottom front of the card.